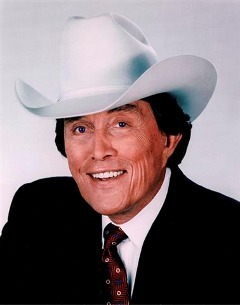 Jimmy Dean grew up in a poor family in Plainview, TX, and learned to play the guitar and harmonica in childhood. He dropped out of high school, served in the Air Force, and had his first country music hit in 1953, with "Bummin' Around". He wrote the lyrics and sang "Big Bad John", a #1 song on both country and pop charts in 1961, that told the story of a giant mine worker who rescues other miners after a cave-in. Subsequent hits included "Dear Ivan", "Little Black Book", and "P.T. 109", "To a Sleeping Beauty", "The Cajun Queen", and "I.O.U." His local TV show in Washington DC gave early-career publicity to country stars from Roy Clark to Patsy Cline. His later network shows helped spread country music beyond the South, and gave national exposure to George Jones, Buck Owens, and muppetmaster Jim Henson. As an actor, Dean was best known for a recurring role on TV's Daniel Boone with Fess Parker, and as the mysterious billionaire in Diamonds Are Forever with Sean Connery. He invested his show business earnings in a hog farm, which soon became the Jimmy Dean Meat Company. Using his grandfather's recipe for making sausage, he became famous to younger audiences as the pitchman for his Jimmy Dean Pure Pork Sausage. He sold the company in 1984, and it is now a subsidiary of Sara Lee. In retirement, Dean completed high school and earned his diploma in 2003, at the age of 75. His autobiography, published in 2004, Is 30 Years of Sausage, 50 Years of Ham. Some references claim he was a distant cousin of actor James Dean, but the evidence is scant and Jimmy Dean himself made no such claim.